In this lesson we investigate thread priorities and how we can have the priority set automatically by the invoking thread or assign thread priorities ourselves using methods of the Thread class. By setting a threads priority higher, we can hopefully make this thread receive more of our processors time than lower priority threads. Setting a threads priority is no guarantee that the thread does in fact receive more CPU time as other factors such as waiting for resources may affect the higher priority threads performance. Also the way the underlying operating system implements multitasking may also affect thread performance and a lower priority thread might under some conditions actually get more CPU time than a higher priority thread. Generally speaking though, threads with higher priorities will get more CPU time than lower priority threads. The priority ranges we can give a thread have to fall in the ranges of two class constants within the Thread class, namely MIN_PRIORITY and MAX_PRIORITY. At the time of writing these values are set to 1 and 10 respectively. We can also reassign a thread priority back to the default rating using the NORM_PRIORITY value, which at the time of writing has a value of 5.
public static final int MIN_PRIORITY Minimum priority a thread can have which is currently set at 1.
public static final int MAX_PRIORITY Maximum priority a thread can have which is currently set at 10.
public final int getPriority() Return the priority of this thread. public static void yield() Will cause the currently executing thread to temporarily pause and allow other threads a chance to execute. To see the possible impact of prioritizing threads lets take a look at running multiple threads without any preset priorities. In this scenario all the threads will default to the thread priority of the thread they were started from. As we are just creating these threads from the main user thread, all these threads will also be user threads and have a default priority set, which is 5. Save, compile and run the TestNoPrioritySet class in directory c:\_Concurrency in the usual way. In the screenshot above we have run the program three times and the totals are fairly evenly spread between the three threads. All the threads inherit the thread priority from the main thread which is set by the JVM to the default which is 5. We use the getPriority() method to prove this and print the thread priorities out. The totals you get out will certainly differ each time you run the programs and depend on several factors such as your CPU and how it deals with threads, what is running on your computer at the time and how the scheduler is set up. As mentioned above thread priorities are no guarantee that a higher priority thread will get more CPU time so it is definitely inadvisable to base thread usage and your coding on priorities. You can of course use thread priorities to take advantage of priority scheduling if it is available, just don't rely on it. To see the possible impact of prioritizing threads lets take a look at running multiple threads where we set one thread to the smallest priority and another two to the maximum priority. 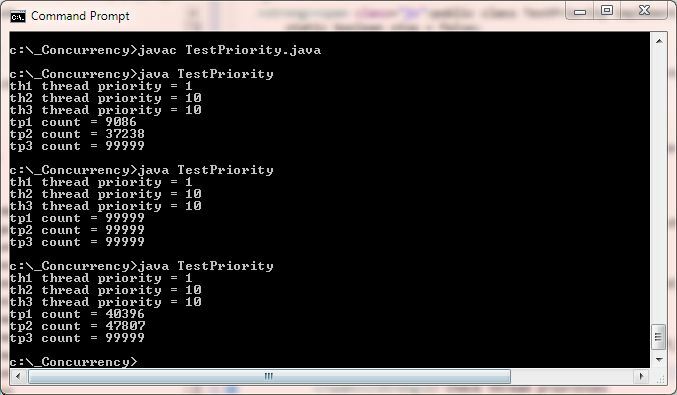 Save, compile and run the TestPriority class in directory c:\_Concurrency in the usual way. In the screenshot above we have run the program three times and the results are fairly inconsistent. On my machine I ran this program many times and there was no guarantee that the higher priority threads got any favourable CPU usage. This program shows that thread priorities are no guarantee that a higher priority thread will get more CPU time so it is definitely inadvisable to base thread usage and code on thread priorities. You can of course use thread priorities to take advantage of priority scheduling if it is available, just don't rely on it. Save, compile and run the TestPriorityYield class in directory c:\_Concurrency in the usual way. In the screenshot above we have run the program three times and the totals are fairly evenly spread between the three threads. Even though we are using the yield() method it seems to make little difference to which thread becomes runnable after a thread has yielded control. 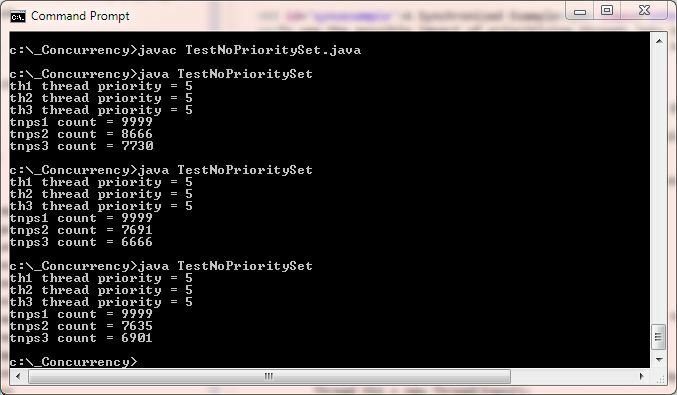 We will adjust the above code slightly to check the priority value and then yield for threads with a priority of 1. 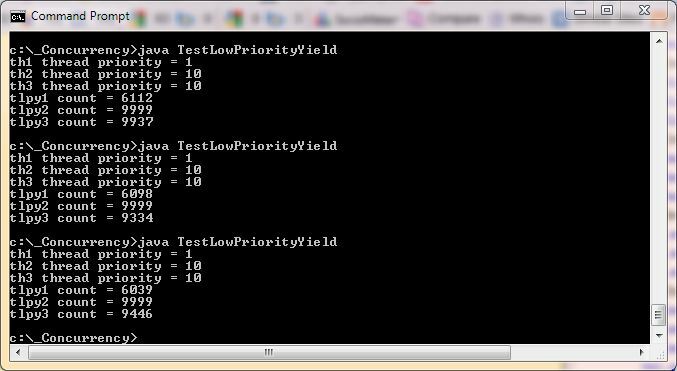 Save, compile and run the TestLowPriorityYield class in directory c:\_Concurrency in the usual way. In the screenshot above we have run the program three times and the totals for the higher priority threads are always higher. In this very contrived example we always yield on the 'th1' thread as it is the only thread with a priority of 1. In fact I ran this code many times and the 'th1' thread was always the lowest due to yielding. To do this we are relying on a threads priority which isn't really a reliable or good practice. Thread priorities are no guarantee that a higher priority thread will get more CPU time so it is definitely inadvisable to base thread usage and your code on priorities as we have done here. In this lesson we investigated thread priorities and how we can have the priority set automatically by the invoking thread or assign thread priorities ourselves using methods of the Thread class. In our final lesson of the section we explore how threads can communicate with each other when they are within a synchronized method or code block.